Easter Bunny Kissing info about the game-Games2Rule. 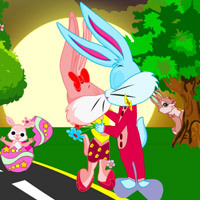 A cute young bunny couple celebrating eater day on a park and where in the mood for kiss. Kissing in a park will always be a fun! Make the cute young bunny couple to kiss without getting noticed by other bunnies. Just hold down your mouse to keep kissing as long as you can. Do it and fill the kissing loader within the given duration in every level. Happy Easter. Have Fun!